Evaluation of Practice & Community Reports (EPiC Reports) enable The Medicus Firm's clients and candidates to make informed decisions. 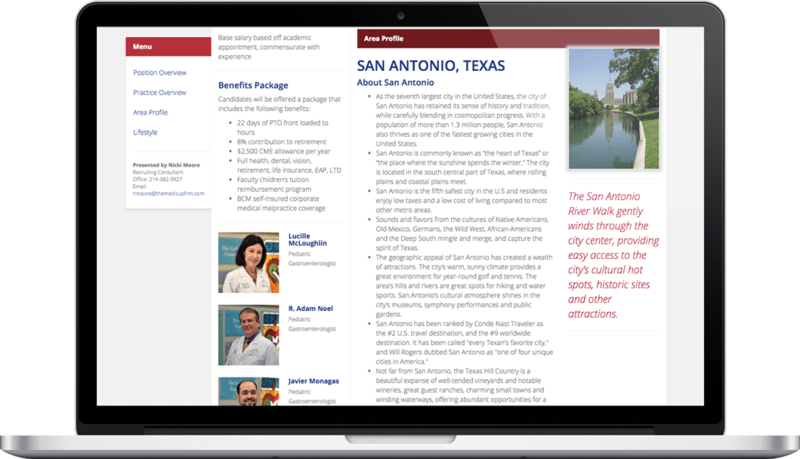 The Medicus Firm has invested in the best technology to enable the client and candidate experience team to produce customized content tailored to each opportunity represented in any community nationwide. EPiC Reports are not a collection of links to other websites, but contain original content developed by The Medicus Firm with input from its clients. Physicians and advanced practice clinicians- EPiC Reports provide unparalleled insight into the community and practice being considered. From education, to climate, to proximity to other cities, the level of depth provided in EPiC Reports is unmatched and puts candidates in a position of knowledge and confidence that there will be no surprises when visiting an opportunity represented by The Medicus Firm. Further, all details associated with the practice, offer, benefits, etc. will be clearly outlined to minimize unanswered questions. Hospitals, groups and employers- Educated candidates are the best candidates. EPiC Reports are web-based and fully trackable to give employers confidence that the candidates chosen for interviews begin the recruiting process with complete knowledge of the opportunity's community attributes, employment offers and their preferences. The premium technology used to create EPiC reports produces an engaging, user-friendly experience from a desktop, laptop, tablet, pad, or smartphone. 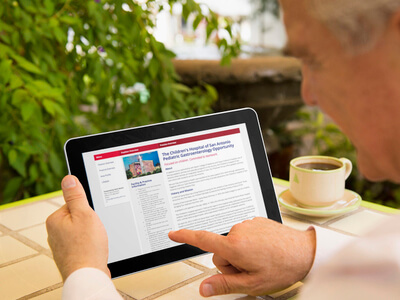 Convenient mobile access is paramount, as studies and metrics confirm that physicians view media significantly more often from a mobile device than from a desktop computer. Each EPiC report contains completely original and customized content to most accurately describe the nuances of every practice opportunity, community, and physician need. Additionally, clients contribute to the reports with their unique, first-hand perspective of the practice opportunity, providing candidates a virtual sneak peek at the practice from the comfort of their own homes. 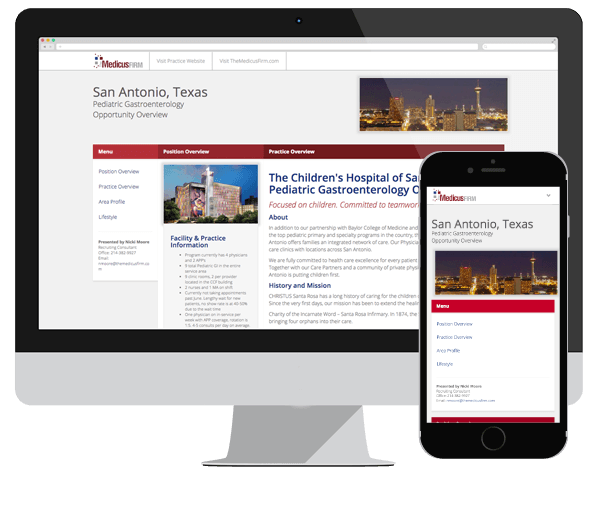 The thorough detail provided within each EPiC report allows physicians and advanced practice clinicians the opportunity to learn as much about the practice as possible, before investing the time and money needed for a site visit. The site visit then becomes simply a confirmation of what was already learned in the report, and a chance to interact with future colleagues. Employers also benefit from the opportunity to address potential concerns prior to investing in travel costs.